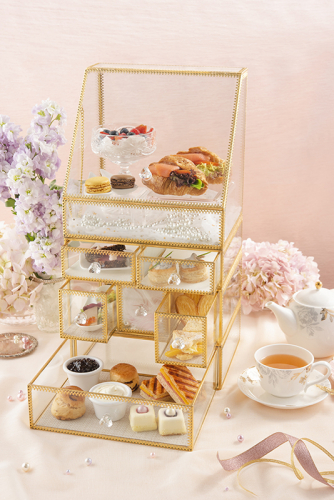 (Hong Kong, 4th June 2018) – In the summertime, we are all expecting the pleasant sunshine, as well as the vivid skyline to enjoy a relaxing afternoon tea with your besties! 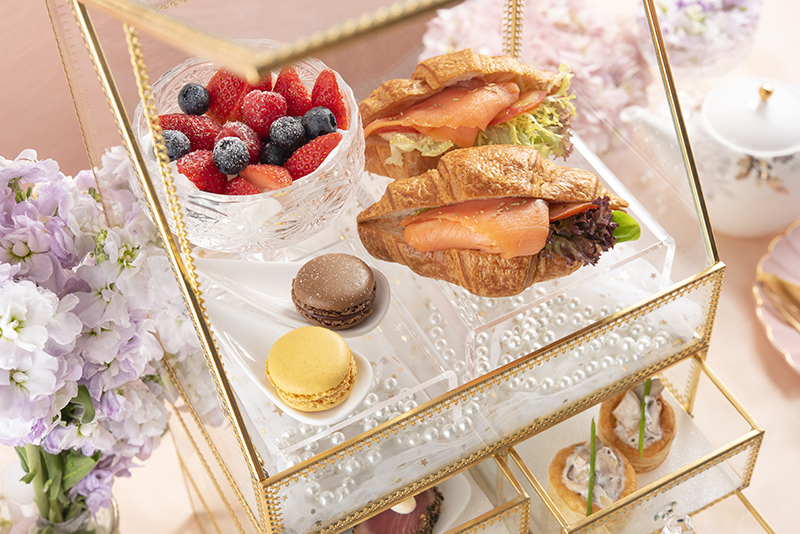 This season, Uptop Bistro is presenting the “Brilliance of Pearls” Afternoon Tea Set (from 1st June) with elegant and delectable snacks and decorations. So you can enjoy some nibbles, sip on a sparkling cocktail, view the panoramic harbor view and have a sparkling day! 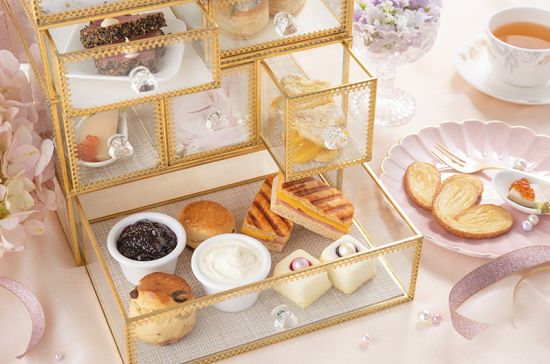 The new afternoon tea set has taken a beautiful jewellery box as one of inspirations to create a brilliant touch. A 4-tier transparent jewellery box with gold linings and diamond-like handles is also chosen to contain the savoury and sweet delicacies inside. Taking the snacks out of the mini-drawers along with the decorations like pearls, feathers is one of the most refined afternoon tea experience. For the sweet delights, “Mango Napoleon” as one of the French classics, is made into layers of fluffy heart-shaped pastries with fresh mango and creamy vanilla custard in between. “Mini Cheese Cake” is the New York style cheese cake turned into bite-size portions for a perfect mouthfeel. The pearl-like garnish, smooth cheese and buttery base are a satisfying combination. “Homemade Scones” with the toothsome raisins is a double indulgence with the accompanying strawberry jam and sour cream cheese! “Fresh Mixed Berries” is a medley of colourful and fresh strawberries, raspberries and blueberries, which are mixed to become an appetizing and healthy treat. The aromatic “Macaron” and crunchy “Palmier” are equally scrumptious and not to be missed! The savoury items in the set are also very tempting! “Mushroom Vol-au-vent” is created from a round tartlet of puff pastry, with mushroom in cream sauce as fillings. The chewy funghi and the puffy crust combines in a bite for a memorable texture. In “Smoked Salmon Croissant”, the dill smoked salmon from Norway is selected to put together with fresh tomato, salad green and a buttery croissant to become a yummy bread. “Pepper-crusted Tuna with Caviar Canapé” is the tuna fillet coated with black pepper and seared to perfection. The caviar can add extra freshness to the semi-cooked tuna! “Cheese & Ham Panini” is a hearty sandwich with melted cheese and flavourful ham. The smooth “Foie Gras Mousse Canapé” plus salmon roe and salad green can satisfy your mouth and sight! 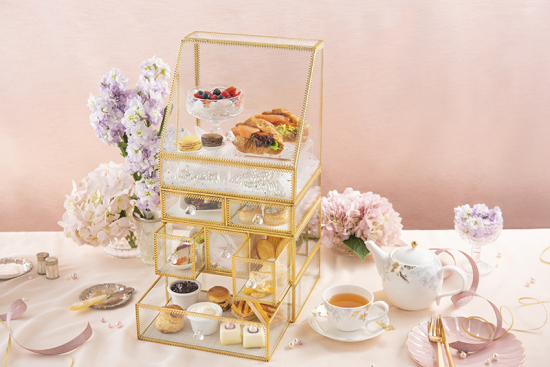 For the drinks, apart from the classic collection of tea and coffee, guests may add $48 per person and upgrade the drink to cocktail “Rose Glam”, a harmony between rose and Prosecco. You may also add $68 per person to enjoy one of the gold leaf-infused drinks: the extravagant lime soda “Jade Gold Leaf” or sparkling wine drink “Diamond Rain”! Apart from the “Brilliance of Pearls” Afternoon Tea Set, fans of our popular “Deluxe Ferris Wheel” Afternoon Tea Setcan still enjoy the fairytale tea set at Uptop Bistro! The “Brilliance of Pearls” Afternoon Tea Set is available at $398 (+10% S.C.) for two every Monday to Friday or $428 (+10% S.C.) on Saturdays, Sundays and public holidays, and “Deluxe Ferris Wheel” Afternoon Tea Setis available at $348 (+10% S.C.) for two every Monday to Friday or $388 (+10% S.C.) on Saturdays, Sundays and public holidays. Located in Tsim Sha Tsui, the Popway Hotel is a city chic, beautifully appointed 63-room hotel. Perfect for visitors to Hong Kong who enjoy convenience, great shopping and cultural sights, as places of interest are all within walking distance. 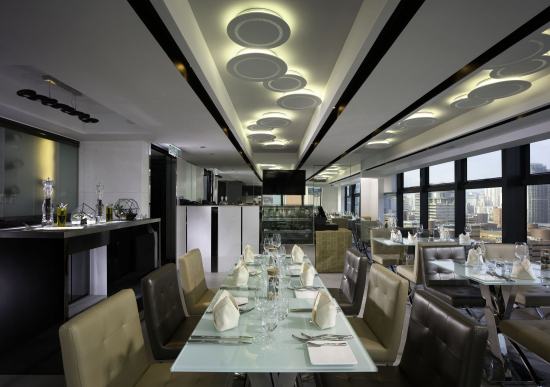 The hotel, personally managed by the owner, has a fantastic restaurant, Uptop Bistro and Bar, and a Sky Deck rooftop with panoramic views of the Hong Kong skyline.